We're nut eaters. Pretty much equal opportunity nut consumers at that, though we do have our preferences. I'm a complete sucker for Macadamia, Pecan and Cashew. Luckily for me, none of of my immediate family appreciate Macadamias, though we do battle over Pecans, Cashews and Almonds. Almonds are slightly lower in fat that pecans, macadamias and walnuts and we started eating more almonds as a way to help lower our cholesterol. The internet is full of information about the health benefits of almonds, specifically their effect in reducing cholesterol. My husband prefers his almonds roasted without salt. I really enjoy my nuts salted and can justify that sodium intake as I have reduced it in so many other areas of our diet. If you go to the grocery store to purchase roasted almonds, they invariably have added oil in the ingredients list. Once again, in an attempt to take back the control of what my family consumes, we came up with a way to satisfy that savory craving, without the added salt. I buy a 3lb bag of raw almonds at Costco for $15.99. 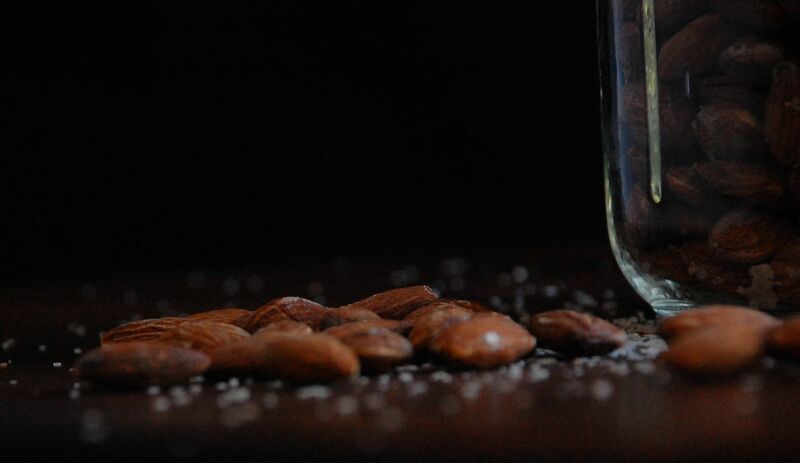 I haven't done a cost comparison between purchased roasted salted almonds and my homemade; but its worth something to, once again, know and be comfortable with what we're consuming. 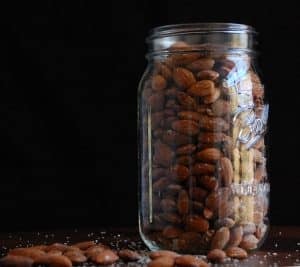 I have used this same method of roasting and salting with pecans and found that they need to cook for a shorter time. I'd just watch them every 5-7 minutes to make sure they don't burn. Preheat oven to 300′. Use convection if you have it. Add remaining salt and toss. Roast for 30 minutes, stirring every 10 minutes. After 30 minutes, remove 1 from the oven and taste. If its a wee bit ‘moist' put back in the oven for 10 more minutes.